Excellent. Most of the popular ornamental onions are hardy to -25F (-32C). Topdress with rich compost in spring, when new growth appears. Fertilize with a liquid fertilizer in early summer, when the plants are in full leaf. Allium, Garlic and Chives. The rounded flowers of many ornamental alliums work like colorful exclamation points in mixed flowerbeds. The leaves appear before the flowering spikes. In late summer, use bushy annual flowers to hide the fading foliage of spring-blooming alliums from view. Set out dormant bulbs in the fall, or transplant container-grown plants in early spring. Cover the bulbs to four times their depth with loose soil. Allow 12in (30cm) between bulbs of most varieties; very small species can be planted closer. 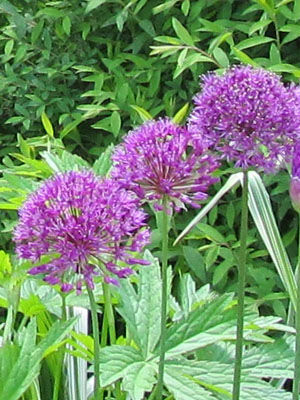 Ornamental alliums often have a light lilac fragrance. Very tall cultivars may need staking to keep them upright. Lavender, purple, pink and white are the most common flower colors. When using ornamental alliums as cut flowers, make a clean cut with a sharp knife or razor blade when less than half of the florets are open. As the flowers fade in the garden, trim them off with scissors or pruning shears. Ornamental alliums have few pest problems and are seldom eaten by deer. Avoid very tall varieties in windy areas.